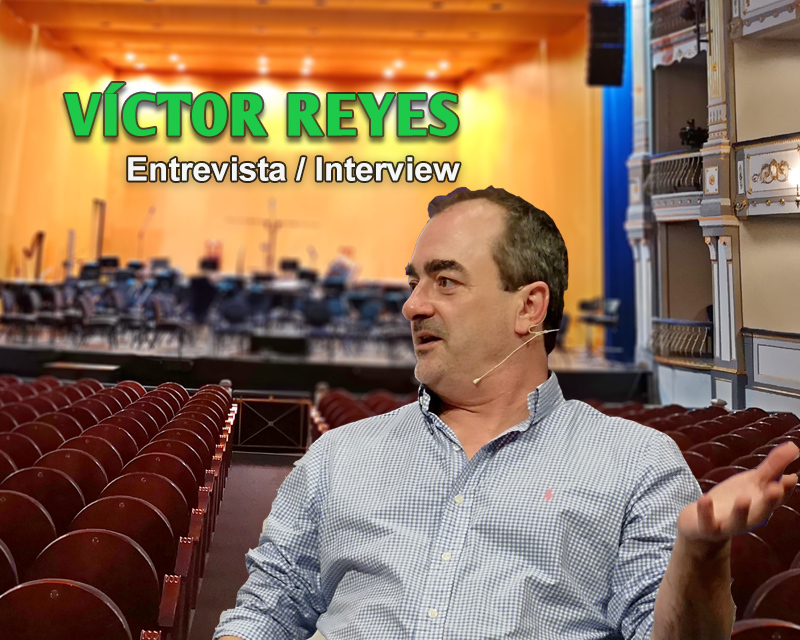 With of the recent participation of Victor Reyes in the Movie Score Malaga – MOSMA festival, we rescue from the archive an interview we conducted with him last year, an interview that looking at its content, could perfectly be related to this last edition. 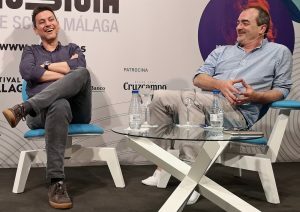 During the interview, Gorka Oteiza had the opportunity to ask Victor Reyes about his beginnings in Salamanca (Spain), his first steps into TV and cinema world in Madrid, his work in his first films, his relationship with the director Rodrigo Cortes, his music for the movie Grand Piano, the series The Night Manager or the movie Perfect Strangers among other things. Victor Reyes has just scored Rodrigo Cortes’ latest film, Blackwood, which premiered on August 3rd in Spanish cinemas, and which will premiere on August 17th in the US. Hello Victor. It is a pleasure to be able to conduct an interview in Spanish. The truth is that all the interviews I have done so far with the guests of the festival have been in English. That’s fine. Because if you do the interview in English, we would both be uncomfortable (*laughs*). (*Laughs*) Ok. Let’s start with a classic question. Tell us a little bit about your beginnings. 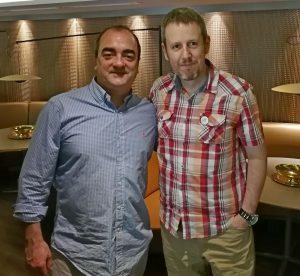 How does a boy from Salamanca (Spain) decide to embark on the adventure of film music? Is there a specific moment in which you say, ‘yes, I’m sure I want to do this’? Or rather you started with music and then little by little you moved to the world of movies and television? In my case, I had an approach and a curiosity, a passion for film music since I was very young, since the 60s. Now I am 55 years old and the first thing I remember are the soundtracks of Ennio Morricone from the 60s. The soundtrack of ‘The Good, the bad, and the Ugly’ and all those soundtracks of the time. Precisely because my father was a big music fan, I had the records at home and I could listen to them, and this was very rare for the mentality of a 6 or 7 year old boy in Salamanca, a city of priests and cathedrals, a city very far away from the whole world of Hollywood. For the mentality of a child of the time, seeing the words Original Soundtrack was a mystery. At that time, I studied music at the conservatory and with the nuns, and I studied the classics like Bach, or classical music in general, but to see those words printed on an album “Original Soundtrack of the film”, it was a mystery to me. I thought, “With the amount of music that’s out there in the world, how is it possible that these guys have to compose a special soundtrack for this movie?” That was something that caught my attention! It was my first illumination, like a vision! I thought… This is something weird! Do not forget that we are talking about the 60s in a city deep inside Spain. Well, that was the first thing that caught my attention, the fact that you had to make music especially thought and designed for a movie. It seems very simple, but if you think about it, it is difficult for many people to understand. The truth is that you are right, there are many people who think that the music of a movie is just there… that is music that has been taken from somewhere else and has been put in the movie, to help or to accompany the images and nothing else. This simple concept is sometimes difficult to explain. Music has a very powerful narrative power. It is a concept that is sometimes difficult to understand, but the more you understand it, the more it will attract your attention. There is an anecdote that I always tell, that is when I first watched Star Wars. Well, there’s a very famous anecdote by John Lennon, in a very famous interview where he says that when he was a kid, he went to see Elvis Presley’s movies, and saw that Elvis was very handsome, surrounded by girls in a swimsuit, in Hawaii, singing, and they had a great time. And he said… that’s a good job! That’s what I want to do! Yes, he was! (*laughs*) Well, something similar happened to me with Star Wars. I told myself … look at this man, this John Williams, recording with the London Symphony and having a great time with George Lucas and making a wonderful movie. This is cool. This is what I want to do. And that was my revelation. Now, from thinking that, to being able to put it into practice, there was a big gap. And if you think about it coldly, at that time and in that place, it was almost impossible. The beginnings always tend to be complex. And look, let’s take the opportunity to talk a little bit about your beginnings… Because you started composing music for television, didn’t’ you? You are right. You have to keep in mind that just as John Williams comes from a classical school of composition, a serious school, in which you see a score and you see clearly that he knows what he is doing, we do not have that background. We, or at least many people of my generation, come from the Pop. We are children of Pop Music. In fact, if you look at the scores of James Newton Howard for example, despite everything he does, at their root, there are traces and influences from the Pop. This man was Toto‘s arranger, and he worked for many years with Elton John. 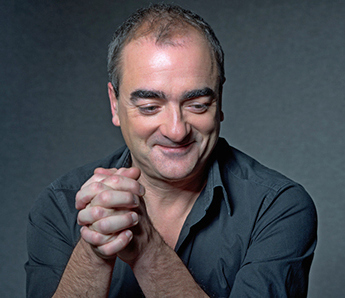 And in his music you can see a Pop Music influence, taken to the narratives of film music. And as I say, I come from that inheritance. So, to find my way, I first looked to enter a Pop Group, because what I wanted was to make music. 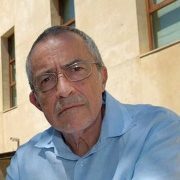 Later I moved to Madrid, and there I started working with several groups. I got to Mecano (NOTE: a very famous Spanish group), and that’s when I start to enter the studios and I’m amazed by what I see. Until then, I had never entered a recording studio. It was something that did not exist in Salamanca. But despite being involved in the Pop world, you already had a clear objective that you wanted to go to the world of movies, right? Yes of course, I had that goal in mind, and I was looking to get to it little by little. The first thing I had to do was to survive. This is the first thing to do in this world, survive. And for that, for example, I made a lot of work for publicity. It was a technical period of learning many things, always with the vision, or at least the dream, to see if I could reach that horizon of John Williams and Ennio Morricone that I had as a child. That horizon is there. Another thing is to get it. It is a process. 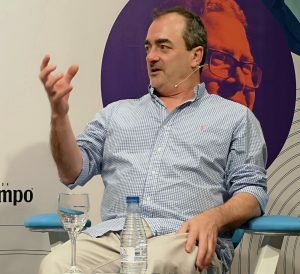 Since you talk about advertising and television, from what I understand, you were a resident composer in Antena 3 Spanish TV channel, right? I’ve done everything … everything (*laughs*). I’ve composed a lot of music for TV series and TV movies. In fact, people know more of my music than what they think. Because at that time, you saw a lot of television and there was not much choice. There were a few channels, so want it or not, at some point my music was arriving to them. Then, there comes a time when you jump to the movies. Was it something that came to you or was it something you were looking for? Well, the truth is that you are always there, to see if you can get an opportunity, but the thing is that the projects almost always come in many unexpected ways… they happen because somebody told something to someone else and then… suddenly in the end, you appear in a new project. 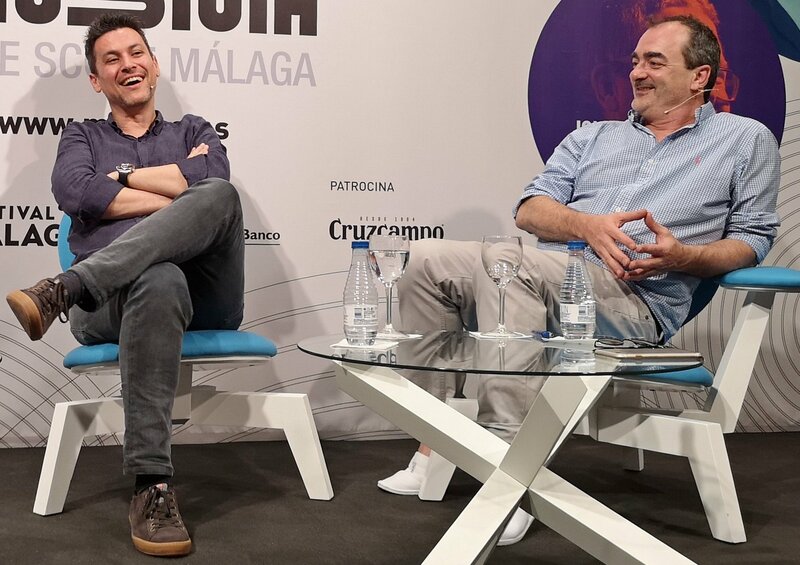 I made the films “Como un Relámpago (1996)” with Miguel Hermoso and then I made “Lisboa (1999)” with Antonio Hernández … And that’s when I said… Wow! Composing for a movie is amazing. But of course, one thing is that I want to do this, composing for movies, and another thing is that I can do it. Because the memory I have of “Lisboa” is that there was a lot of stage fright. It was a very big project for me. I remember being at home watching the tape and think “well, and now what do I do?” Because of course, facing a blank tape, without any music, is quite strong. How do I compose the music? It depends on my taste, on how I’m feeling, on what does the movie convey to you… And at that moment, you get the doubts. Where do I enter? What kind of music does the scene need? What does this scene mean for the director? Will we be on the same page? The truth is that if you look at it like that, there are many options, and it has to be complex. For example, imagine the scene “the actress opens the door and see the corpse”, and then, what do I do? Do I enter before she opens the door or Do I enter when she sees the corpse? What tone do I give to music? Intense or soft? How will that be related to the rest of the elements, effects, dialogues?… and of course, you can’t be calling the director to ask those doubts for each of the scenes, because that shows insecurity. So, the best thing is to do what you think you have to do. But of course, when you’re at the beginning and you have not composed for any other movie, the best thing is to watch a lot of movies, and take references, examples, see how they are telling and narrating things. It is a total learning process. Of those projects that you had at the beginning, is there any project that you keep a special memory of? One that you say, “this project has been something important for me”. “The City of No Limits” and “Lisboa”. The 2 of Antonio Hernandez, which went very well. 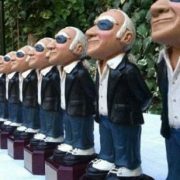 In fact, with “The City of No Limits”, we were even nominated to the Goya Awards. And when this happens, you start to feel secure, and you feel like you’re doing the things right. It’s when you have to look in the mirror and say “Keep it up. Keep working quietly and honestly. You are going in the right direction”. You are right. And since you talk about The Night Manager, let me tell you that it’s always the same, it’s always a coincidence, and you get to the projects in the most curious way. In 2016 I suddenly got the series, which had 6 hours, which in reality is almost like getting 6 movies. It was a complicated and demanding job, but the producers and the editor were very kind, as they clarified many aspects of the plot that helped me define the music. I was sending the chapters with my music, and they told me what they thought. They told me things like “be careful because in this scene, he knows that the other man does not know what is really going on behind, because…” and I had to be careful when applying the music, to reflect that, not to discover to the spectator something that could not be revealed yet. That, for example, in romantic movies does not happen that much, but in thrillers you have to be very careful. The music is absolutely declaratory. If you are not careful, you are discovering the bad guy. Yes, that’s something we’ve always said, music can completely change the perception of a scene, and make the good guy look bad, and the bad guy look good. Of course, keep in mind that music is above the image, and tells things that the image cannot tell. Remember, for example, the music of John Williams in the Empire Strikes Back, and notice how simply changing the last bars in some of the moments of the film, you know that Darth Vader is there although you do not see him. We’ll come back to The Night Manager later, so let’s talk about movies now. Let’s talk about Rodrigo Cortes, who is a director who is an important part of your career, and with whom you have collaborated in many films. How do you know each other and how does this collaboration start? Well, Rodrigo appears one day at home with his movie “The Contestant (2007)”, the first film he directed. He liked the music I did for the “The City of No Limits”. In fact, he had put some music of that movie in his, because it seemed to have an appropriate tone. In the end we ended up doing other things, but the beginning came that way. We did “The Contestant (2007)”, then we did “Buried (2010)”, “Red Lights (2012)” and we’ve continued up-to “Blackwood (2018)”. Rodrigo is a very special character. I have to get him out of the rest of the people in the film world. He is a guy with enormous creativity, and also, he knows how to explain himself and he knows how to lead. He knows what he wants, and he knows how to tell it. He knows how to reason things, and he is a musician, and controls what he talks about. Yes, for me it is something fundamental. That’s why we work so well together. How does the way of working with a director evolve, when you already have been together on several projects and several films, and you already know each other? Does that really influence the creative process? The truth is that it is curious that you mention it, since it always happens the same thing to us. At first we have it very clear, we always know clearly the soundtrack that we want to put in the film. And interestingly, based on being wrong and trying out ideas, we end up making something that has little to do with the original idea, and that coincidentally in the end, was the final solution. So the collaboration has a search process, a research, which makes it something unconventional. You could say that each collaboration continues adding up. When you start a new movie, in what part of the process do you start getting involved? Do you start from the beginning? From the initial ideas? It depends on the project, but keep in mind one thing, that we do not have to forget, and that is that curiously or unfortunately, we are post-production. And let me explain it… Usually, everything is assembled and finished, and then comes a time where you have to put the music. And that is the case on many occasions. If you look at the credits of the film, we are in the post-production part. That is what usually happens. But sometimes that is not the case. 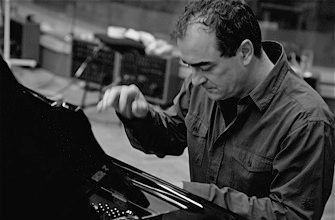 For example in “Grand Piano (2013)”, the story talks about a pianist and a piece that is unplayable, a piece that cannot be physically performed, so the story is centered on the music. In that case, that music had to be created beforehand; it had to be prepared before the shooting, so that Elijah Wood’s character could perform it. Although then, in the end, we changed things, because we had second thoughts about some scenes, but we have diegetic music, music that the actors are playing, and that music has to be done before filming. That means that we have to think carefully about what we are going to do, although later in post-production we can change it. It is part of the planning. Well, this case is different, because music is a very important or rather fundamental part of the story, isn’t it? Yes, but this is a very special case. For example, now I’m doing the last movie of Álex de la Iglesia (Note: in reference to Perfect Unknowns – 2017), a movie that is amazing, that has a very funny magic touch, and where it is very interesting to see how the story turns around and find what happens in the end. 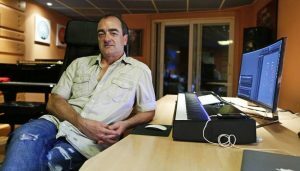 In this case, Álex already had the final cut ready and they passed it to me to compose the music. Well, actually there were some last minute changes, but little thing. Going back to “Grand Piano”, as a curiosity, I will tell you that the piece of Grand Piano itself is an un-performable piece. The concert is the concert, and that can be performed, but there are moments of “La Cinquette” that cannot physically be played. Well, and out of curiosity, how is an un-performable piece composed? Well, we started doing tests in the mockups and we added layers and layers and… of course, there are passages in which there are up to five pianos playing, which makes it impossible. (*Laughs*) And then we recorded everything in London with a real pianist. On the other hand, the concert itself is a normal concert, which in addition to classical piano, had to sound like Rachmaninoff or Tchaikovsky, something grandiloquent, that had pianistic skills, and besides all that, it was the score, the soundtrack of the movie. 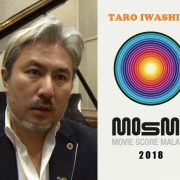 In other words, the concert was the score, and it had to generate what a soundtrack usually generates in a film, besides acting as a concert piece. So I had to fit a narrative of what was being told. I think that was the most complex work, to make everything fit. Because, there were things that I completely changed from the first initial mockups. When you are watching the musicians in the orchestra, they are playing really. We made many changes and many adjustments, so that not only cinematographically, but also musically, everything was very credible. Let’s talk now about the series “The Night Manager”. It is a series that has received many awards, not only the Emmys, but critics’ awards and some very varied prizes. How do you get to the series and what approach do you make with your music? Did you receive clear guidelines of what they wanted, or were you the one who proposed ideas? As I told you before, and as has happened to me on other occasions, it was a coincidence. They called me and told me to have a meeting with the director, Susanne Bier. The day before the meeting, I received a link to a page to see a bit of what the series was about. And using the iPhone, I recorded a video of about 5 minutes. Using that video later, I got down to work and wrote something. And so, the next day when I went to the meeting, I brought something ready, and the truth is that it was the last thing they expected, to have already some music and some ideas. They liked it a lot. They had a “temp-track”, which guided a little bit where you had to go, but that’s where my art comes in, because I’m a specialist in throwing it all away, and doing something totally opposite, or not, just according to what I believe the scene needs. 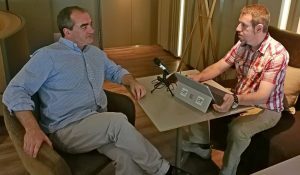 I always propose what I think will work best in a scene, and I knew that what would work best in that scene was something of the John le Carré style, mystery, politics, with a clear melody, with a clear “Main theme”, something short, of 5 seconds, that would immediately allow people to associate ideas. And that’s what I did. I sent them the first chapter with the music that I thought it needed, and they loved the style and the concept from the start. To give you an idea, they sent me the intro, the “Main Titles”, 45 seconds with an impressive animation about weapons and a plane that drops bombs… and they had put there as a reference … a song from Gray’s Anatomy! And then look at what I did, something at triple the speed, something orchestral… I wanted to draw the audience’s attention, with rhythm, something frantic. You had to get the attention from the beginning. I will tell you a memory that I have, and it is that with the first episode broadcast by the BBC, an hour later, there was already a YouTube video that read “The hottest main titles”. So, we saw the response from the public immediately. Yes, but as you see, it’s the same as always, you have to try and experiment until you find what fits best. You have to be wrong, and then change things. Because nobody here has the Philosopher Stone or the magic recipe. Let’s talk about the Emmy that you received for your music for “The Night Manager”… but before that, a curiosity, do you currently live in Los Angeles? I live in these moments between Madrid and Los Angeles. But I spend more time in Madrid. It’s true that I’ve been in Los Angeles for some time, but I get so depressed… (*laughs*)… that I get back to Madrid with my family. Although it may not seem like it, I am a very familiar person. And also, the work method that I have, the quality of life that I have in Madrid, in my home in my studio, the truth is that it has no equal for me in Los Angeles. 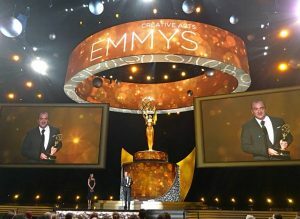 So, back with the Emmy and the awards, is it funny that you got the Emmy in the United States before getting a Goya Award here in Spain, isn’t it? Well, each institution has its processes, its way of valuing things, and the truth is that I do not take it too seriously. I do not think much about his. Not having a Goya isn’t something that worries me. And well, if you look at it coldly, having an Emmy heals you from everything (*laughs*). 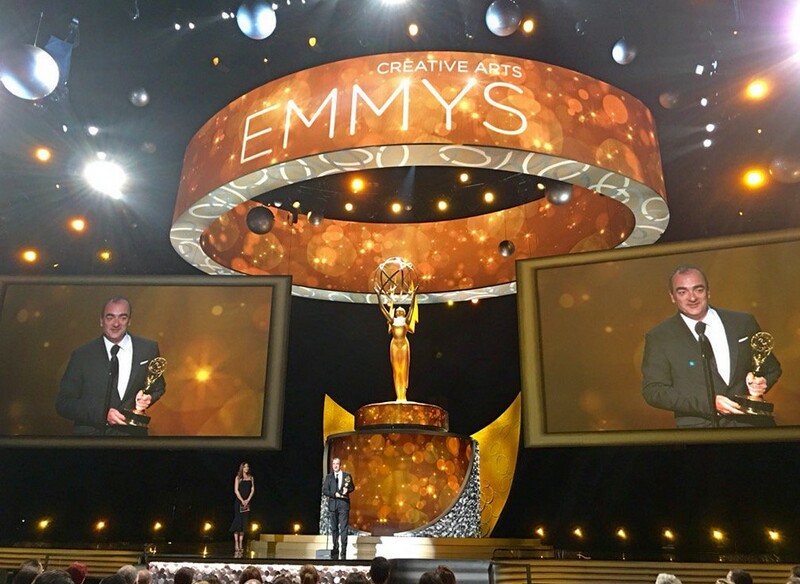 The truth is that it was a big surprise for me to receive the Emmy, because I was nominated with great composers like James Newton Howard. I thought I was going to be just an extra name on that list! But look, I got it. What a surprise! After this award, have you noticed that you receive more offers, that there are more people interested in working with you? The truth is that I have not noticed a big difference. The work continues to flow in the usual way. 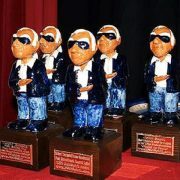 But it is true that the award gives you strength to think and say “hey dude, you are doing well. Keep going on”. If I were younger, 30-something years old, without family, then I thought I would pack up and go to the United States to see how it goes, but with my current situation, the truth is that I think I’m much better here. Let’s keep talking about television. Because you started on TV many years ago, and now you’re back with this series. Television has changed a lot in these years. What differences have you noticed on TV? Television today has nothing to do with what television was 15 or 20 years ago. There are great stars in the series and shows are in charge of large producers. Nowadays the quality in the series is very high. I do not discriminate if I’m making the soundtrack for a series or a movie. I treat them equally. Of course! Keep in mind that the Spanish series, in general, are limited to a very local market, they tell things that happen in a close environment. Americans usually think more globally. They think of a global market. Series are products that are going to be exported to 85 countries. And music has to be in sync with that. It has to be a music that can be understood globally. Let’s finish talking about series … In a movie you know the full story and you know when it begins and when it ends, but in a series, that’s not always the case. Especially, if it has many seasons, because you may not know the importance of a character until many chapters have passed. How do you approach that type of problem? Well, the truth is that it is difficult to address. Many times you do not know how many seasons a series has, nor how the plot will run. Unless you ask the showrunners… and sometimes not even that, because they do not know (*laughs*). Do you prefer to have the scripts with you, and read them when you have to start composing, or you prefer to work with the image? Well, it does not seem like a bad idea (*laughs*). Lately there are many live events that include film music; concerts alone or even thematic film music festivals. What do you think of this phenomenon? What do you think of taking the music from the screen to the streets/concert halls? These festivals, which are helping people to pay attention to film music, which help to spread this art form, are a true wonder. For a composer, to have at our disposal a complete orchestra and even a choir, to be able to perform the pieces live in front of a big audience, is a true luxury. That’s what I think. And I link this with a second question… How do you approach the preparation of your music for this new environment? A music that is designed to work with the image on a screen, which is then taken out of that medium to a concert hall? The truth is that I do not have to spend too much time either, because the music is already done. I try to find some music that looks like the music that you have to play at the concert. Because I’m a bit weird, I’m not very classical, I use electronics, and that is complex to take to a concert. The first advice I would give them is not to admit advice. Get started and get to work. Let’s finish with one last question. If you could choose, what would be your dream project? That project that you have not yet had the opportunity to do? (*Laughs*). Ok, I’m going to specify a little bit more the question… (*laughs*) What would be your dream project … musically speaking? Ok… Now seriously, I do not have any dreams that have not been realized. I take life as it comes. I think that what’s here, comes for a reason. I approach it with energy and with desire, and that is. I think that’s the key. Now with an age, if you look back at my career, I see a sense, and it is because of all the small steps that I have been taking. The world is a place where you have to adapt. This is very important. That seems right. (*laughs*) I think we’ve already taken enough of your time! 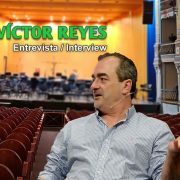 We finish this interview here, and we thank you for your time and your answers, Víctor. Thanks to you for spreading the word on film music, and for being there for us, the composers. You’re doing a great job! 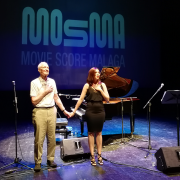 In addition to the interview for SoundTrackFest, below we leave the link to the video that was broadcast live on July 7th, 2018 with the intervention of Rodrigo Cortes and Victor Reyes at the MOSMA, where they were interviewed by Isabel Vázquez.